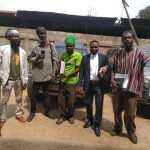 Food Sovereignty Ghana (FSG) appeared before the Accra Human Rights High Court on Tuesday, 12 February 2019, in Ghana’s first landmark case concerning biotechnology, which is challenging the commercial release of Bt cowpea and GM rice, as well as the legal basis for the confined field trials approved by the National Biosafety Authority. It will be recalled that the case was last adjourned on November 16, 2018 to allow the Judge complete her leave of duty. Lawyers for the Defendants are challenging the original jurisdiction of the High Court over decisions made under the Biosafety Act, as Section 26 of the Act establishes an Appeals Tribunal to deal with such matters. FSG prayed the court for time to submit some additional material of relevance for record. The court in turn granted the request and ordered all documents to be filed with responses by all parties within seven days. The case will be reheard on March 11 at 10 am.